Plantar Fasciits is a common foot condition resulting in chronic heel pain. Typically, patients will have symptoms of pain in the heel with the first step in the morning and after long periods of resting/sitting. 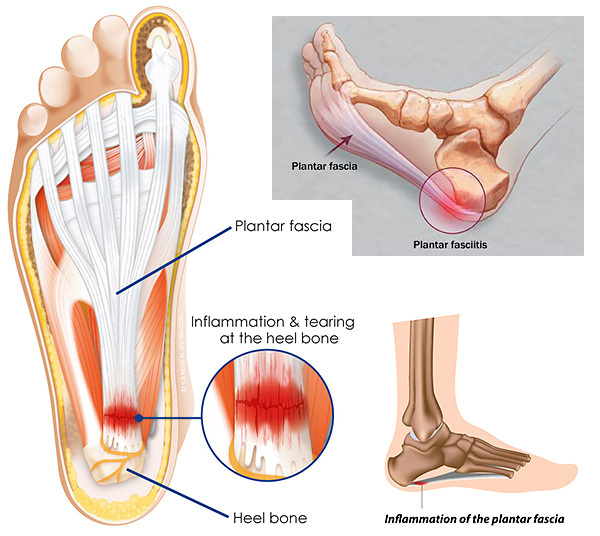 Plantar fasciitis is an inflammation involving the plantar fascia especially in the area of its attachment to the calcaneus (heel bone) and causing pain in the heel. Treatment can range from conservative to surgical intervention. Plantar fasciitis is a repetitive strain injury involving foot and leg muscles, tendons, ligaments and the bones they attach to. Certain foot types, such as flat feet or high arched feet, are more prone to this. Repetitive impact (walking or running) on your feet and legs over time causes your flexor muscles/tendons to become short and tight. Repetitive impact on short, tight muscles/tendons causes micro tearing at the point where your tendons attach to your heel and toe bones. Repetitive micro tearing at the point of attachment causes progressive scarring of tissue.